NerdWallet writers save money on homemade dinners by spicing up simple meals and stocking up on inexpensive pantry staples. No one at NerdWallet is writing about living frugally during the day and then logging off to indulge in caviar and cognac at night. We usually try to practice what we preach. So when dinnertime rolls around, we know a few ways to cook up an affordable meal. Check out our cheap dinner ideas below. Social media writer Valerie Lai adds lentils to meals for a few reasons. For one, they’re filling — one cup of cooked lentils packs nearly 18 grams of protein. Dry lentils also have a long shelf life and cost only about $2 per pound. “Shredded rotisserie chicken from the supermarket makes a million different dinners,” says credit cards writer Robin Frankel. She’ll add it to a salad or use it as filling for tacos and enchiladas. She’ll also throw the shredded chicken in pasta, along with olive oil, Parmesan cheese and a sauteed green. 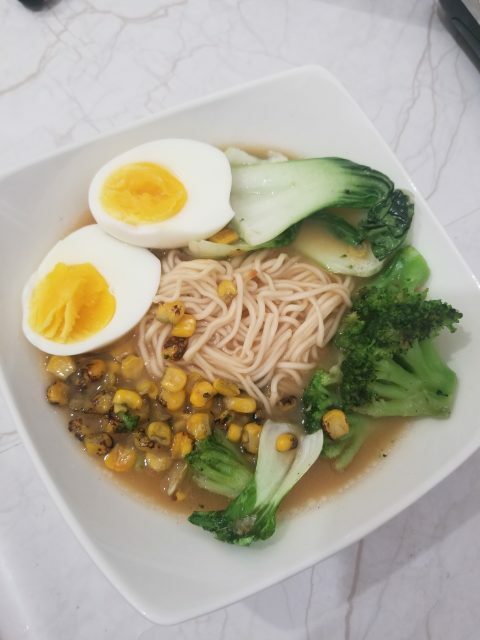 The “dressing up” comes from the vegetables Bessette cooks separately and adds to the soup: frozen broccoli and corn and fresh bok choy. The soup’s (cheap) finishing touch is a hard-boiled egg. Adding cooked Italian sausage to canned spaghetti sauce “makes cheap sauce taste good,” says writer Barbara Marquand. She suggests making the spiced-up sauce on a Sunday and stashing it in the fridge. Then, “on a weeknight, all you have to do is heat up the sauce and boil some spaghetti noodles,” she says. Or you can use that sauce as a base for lasagna, she adds. Stocking up on potatoes and other ingredients that can become a quick meal can dissuade you from ordering food on nights when you don’t have a meal plan, she says. Staples can include tuna for for tuna-salad sandwiches, eggs for scrambled eggs, frozen veggie burgers and bagged salad. Now let’s hear from you. In the comments, tell us your ideas for affordable dinners.